The heavens tremble and the planet quakes as the souls of heroes and villains teeter on the edge of darkness and light. 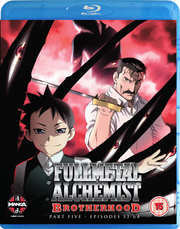 The final chapter of the sweeping epic ­ Fullmetal Alchemist: Brotherhood ­ is here. The Flame Alchemist¹s rebel army pushes the forces of Central to the brink of collapse ­ until the enemy¹s fallen leader returns to take control. As mortals and monsters wage war, young Edward and Alphonse Elric must face a cruel being with the unholy power of a god. After endless adventures and countless struggles, the boys find the fate of the world in their weary hands. When the Gateway closes and the circle is complete ­ who will be left alive to celebrate the astonishing sacrifices made in Fullmetal Alchemist: Brotherhood, Part 5?